One of the universal tenants of Lazy Man and Money is, well, laziness. I try to find ways that I can maximize my dollar without sacrificing quality – or at least finding a good balance in value for my dollar. One of the things that I’ve been against in the past is coupons. I simply didn’t see the value in buying a Sunday newspaper (I get my news for free online), and spending time clipping coupons. 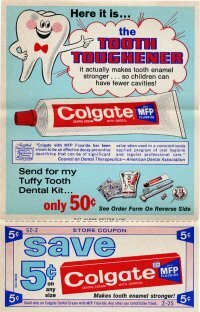 The coupons are always for brand name products, which cost more than generics. I figure that by the time I’m done using coupons, I’m back to paying the price I was before. Things changed two weeks ago. On a Sunday shopping trip a representative of the local newspaper offered a free edition of the Sunday paper. It was part of a promotion to get people to sign up for the long term. I was about to reject it as I had no real intention of reading it, when I realized that it’s worth looking for the coupons. You see, I’ve started shopping at military commissaries, because their prices for most brand name products are even cheaper than generics at my closest grocery store. Suddenly coupons have value because generics are no longer the cheapest option for me. On Tuesday, I set out to the commissary with a pile of coupons in hand. I was a little overwhelmed, it was difficult keeping each coupon straight. It was also difficult finding and matching up all the coupons. I ended up spending twenty minutes more than I normally would have. I also ended up with a lot of non-perishables. I don’t think we’ll need toothpaste for quite a few months. My final savings at the end, $6.90. I felt I should have saved more, but when I look back on it, a number of the coupons weren’t for expensive things. In the future, I’ll look more for coupons that deliver bigger savings. I think if I’m going to continue to use coupons, I’ll have to start buying coupons on Ebay. I don’t think I want to spend the time clipping them myself. Plus I’d rather not buy a newspaper I won’t read. You’re going to spend money to buy something, that will save you money? Maybe (probably) I’m missing something, but wouldn’t you be better off just not spending the money in the first place? I’m a big fan of things like soap, shampoo, and deodorant. The coupons are for basic groceries like food and hygiene products. Buying coupons??? That’s very unlazy… I like how commissaries will take expired coupons. It takes twenty seconds to buy coupons on Ebay. Okay maybe a minute. I found a few last night that should save me $10 easy. When I was first married, my wife and I clipped coupons and found that we bought items not because we needed them, but because we could use the coupon. Some items saved us money, but most of the time I bought items to try them out. I think this is why they give out coupons, so we try something new. Or, they have a milk coupon, but you have two buy two bags of oreos. Don’t get me wrong, I love Oreos, but it’s not saving me any money. Question? Do they ever have beer coupons? I think coupons are like costo and sams club- they have their place but if you’re not careful you don’t actually save much money at them. I know people who swear by Costco but the reality is they spend more because they have to buy bulk and then they have to store all of the stuff they buy. With coupons its the effort. If you find some that work then great but I’m of the lazy approach – for the most part its just not worth the effort. Lots of people buy coupons on Ebay because they can get them for pennies on the dollar and sometimes the saving can really add up when used in places like CVS and WalGreens. I just got into them too. In this economy, you almost have to save whenever and wherever you can.